Receive a free estimate on your vehicle repair when you contact us. No matter how responsible of a driver you are, it can be next to impossible to avoid dents, dings, and damage to your vehicle while you’re behind the wheel. Whether it is caused by the roads, by the weather, or by other drivers, body damage is a reality that drivers have to face. 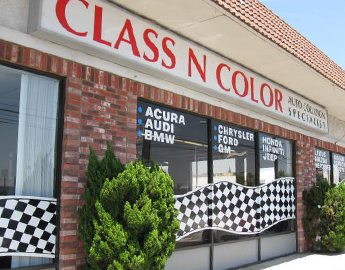 Look no further than Class N Color Auto Collision when you’re looking for quality automotive collision repair and refinishing in Los Angeles, CA. Give your vehicle the treatment it deserves with our quality auto body repairs. Let our team of factory trained auto body repair specialists get you back on the road quickly. We are the team you can put your faith in for all bodywork and frame repair, regardless of make or model. Our team prides itself on providing the most reliable repair services around all at competitive prices. Backed by a lifetime warranty, you can count on our services to keep you on the road for years to come. Our team is even experienced with the process necessary to handle insurance claims and will gladly do that for you. When you put your auto body repair needs in the hands of our ASE-certified mechanics, you can rest assured we will restore your car to an aesthetically pleasing, road-ready condition. Whether your needs are cosmetic or you need frame repair, our well-rounded technicians have the skills, tools, and touch necessary to get your car looking its best once again. Getting into an auto accident is any vehicle owner’s nightmare. Not only can it leave you shaken up, but you’ve also got to deal with making your vehicle road ready again. To revitalize your ride without breaking the bank, bring it to our car accident body shop today. Our goal is to restore our customers’ vehicles for an affordable, reasonable price. When you need competitively priced body work done right, turn to our top-notch technicians for custom bodywork that’s sure to meet your needs and budget. Best of all, we back our work with a lifetime warranty, meaning you can count on our services to keep you on the road, raring and ready to go. At our auto shop, our skilled technicians specialize in single body and frame repairs for a wide variety of the most popular makes and models. From minor dents to comprehensive frame restorations, you can count on our versatile technicians to correct any issues you may have. We make sure to follow manufacturer specifications, so you’ll be left with a flawless fit, finish, and operation. Bring your vehicle in to us, and we’ll provide you with excellent workmanship so that you can get back behind the wheel as quickly as possible. Part of our commitment to our customers, we take care of everything you could need post-accident. If you need towing services to get your damaged vehicle to our shop, we’ve got your needs covered. We’ll help you find a suitable rental car to ensure you don’t get stranded after your accident. Bring your vehicle into our accident body shop, and we’ll make sure to treat you and your car with the utmost care and respect. As motorists ourselves, our technicians understand that you have pressing matters that you have to tend to. That’s why we strive to deliver the exceptional repairs you need as quickly as possible so that you can get back to your normal routine. Let our automotive collision repair and refinishing experts make getting back on the road as affordable as possible. Contact our auto body repair shop for a free estimate today. Based in Canoga Park, California, we proudly serve drivers in Los Angeles and the surrounding areas, including Ventura County.